It's been a while since my last blog, but that's a result of not enough time, and the one trip I managed to make being a bit of a failure. I had a cunning plan to work my way along a stretch of the Trent the next time I found it well up - but I chickened out as the forecast dry day turned into a wet one as soon as I set up in my first chosen swim. Like a lazy fool I stuck it out there from 8.30 in the morning until just after 10pm. I'm pretty sure that if I had moved around I would have caught some barbel and not the three chub I did end up with. I suppose some people would have been happy with one of them, it being a five and a half pounder, and while I'm not dismissing it, it certainly wasn't what I had hoped for with the river three feet up and rising in temperature. That was on the 16th of January, and on the 1st of February with a cold spell forecast to kick in on the evening of the 2nd I got my work out of the way first thing and was on the road by 10.30am, leaving in dull misty and damp conditions. Once over Saddleworth Moor on the M62 the sun began to break through the fog and mist and Yorkshire was bathed in bright, warm sunshine as I headed down the A1 into Nottinghamshire. Setting up at half-one it was an hour and a half before the first chub came along. Small enough for livebait it was! The river level was down to near normal for winter allowing me to hold well out with a mere three ounces of lead, and there was about eighteen inches of visibility. The stretch I was fishing had been good too me over the last couple of winters, rarely failing to produce a barbel. But this season they have been notable by their absence. Fishing on until eleven at night I ended up landing ten chub, all bar one under four pounds, and all falling to the upstream boilie rod fished towards mid-river. The biggest of the chub was another oddly shaped fish. Lying in the back of the car before nodding of for a few hours sleep I mulled over events and tried to formulate a plan. While I was convinced there were still barbel in the area they were going to take some finding, but I knew another stretch that had been consistently throwing up barbel since October. With the frost on its way I had to go for it. The alarm was set for five thirty. I slipped and bashed my right knee on a rock. When I did get hold of the rod the fish had snagged me. I could feel the fish on, but the lead was stuck solid. After various attempts at freeing things the fish had plainly gone so I pulled for a break - which resulted in the lead coming free of the paper clip and me getting everything back. At least it was a positive sign that there were barbel in the swim. It was ten to eleven, in bright sunshine, the early cloud cover having moved south, when the first fish of the day (the bite again coming to the upstream rod) was landed. And it proved to be the first double of the year at 10lb 4oz. 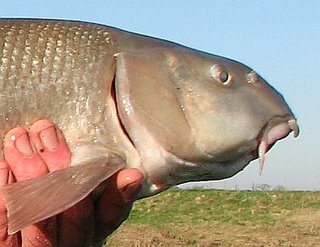 I was going to title this blog "Freak Show", as it was another Trent oddity - a parrot nosed barbel. I'm making a habit of catching weird fish! By now the wind was picking up and the wind chill factor was considerable. But throughout the day fish came along to warm me up. The second fish was perfectly formed, and in such good condition I thought it was going to give me my first brace of doubles, but it fell a couple of ounces short of ten pounds. Still a real belter though, and also to the upstream boilie rod. I'd been varying baits on the downstream rod, trying maggots and pellets. However, two fish to the boilies suggested a change was in order. Boilie on both, and move the downstream rod further out in line with the upstream rod. For whatever reason the next three barbel all fell to that downstream bait. One was around six pounds, one over seven and the final fish of the day, just as the light was going, had me convinced it was a real big fish. Not only did it plod upstream, but it fought like stink under the rod end. It looked every inch a double, a solid fish in tip-top condition it actually weighed 9lb 13oz. No complaints from me, though.